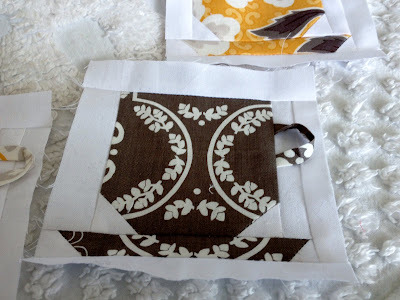 I'm working on more blocks for my 5" block Daisy Cottage quilt. I have been kind of creating on-the-go. 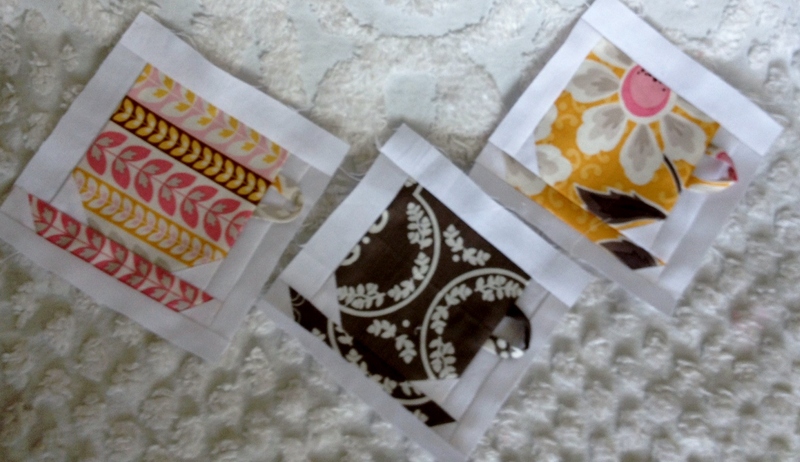 Meaning I really have no overall plan for this quilt, but I'm making blocks using the fabric as inspiration. No blocks are "to scale" in this quilt. The design parameter is just the 5" block restriction. I am working right now on my teacups and saucers. They really are fun to make. I guess that is a parameter: fun for me to create and make. That's it. I made the little handle loops out of my Clover bias maker. I used the green one. I'm going to applique the handle down when I get all my cups made. And I'm also working on Gypsy Kisses, too. I alternate back and forth. I have a new project I need to start ASAP, though. So I may juggle 3 quilts. I had to post this picture of Allison dying eggs on Saturday. She had fun with our little egg hunt. and she loves to play with eggs when we gather them from the chicken coop. So we knew she'd enjoy the dying process. The funniest part was when she couldn't get the dye stain off her hand. She didn't know why that was on her fingers. Fun stuff. What cute little blocks Nanette! I like the little handles -- a very fun idea. Allison looks like she's having a great time with the eggs! Oh what cute little teacups!!! Love the easter egg picture! Dying eggs may be one of my all-time favorite holiday traditions ... and I'm a Christmas fanatic. You just can't beat a tradition that is all about color! Cute picture! I'd forgotten how fun (and messy) dyeing eggs can be. I love the handle on the tea cup - clever and cute! i love your little teacups -- just too dawgone cute! but don't stitch the handles down, they look almost 3 dimensional the way they are. Innovative! The 3-D handle on the teacup is darling! You are always so creative as you make blocks. 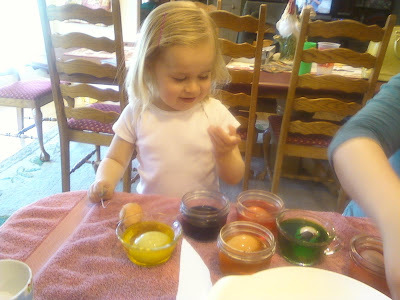 Great blocks as usual and your egg dyeing assistant is a cutie! I am dying to see how your daisy cottage quilt turns out! I know it will never be monotonous working on three quilts at once. Aren't grandchildren the best thing ever created?? Having fun with sewing is a great stress reliever, and your blocks are so pretty. Clever you, using the bias maker! Allison is so pretty. Her hair is really growing. How clever you are with those little teacup handles!!! Lori's fabrics are so fun! And coloring Easter eggs with this little one must have been a lot of fun too! LOVE the teacups!! I am guessing you are making up the pattern in your head! :)I would love to know how to make the tea cups (Measurements of each of the pieces that you piece together for one block...would you share? :)) I made my sister a purse using your Mixed Bag pattern and now she wants your info so she can get the pattern to make a few. :) I have given 3 of those bags as gifts and everyone LOVES them! :) BTW I also love your Berry Fun Row By Row quilt! Happy Sitiching! Love the 3-D handles on your cups. Allison looks so cute dyeing eggs.